This is the fifth release from a very large horn-driven band/orchestra led and arranged by Jakob Norgren. Jakob is a sax player and his baritone is joined by FOURTEEN other horns – five trumpets, three trombones, two bass trombones/tubas, two alto saxes and two tenors. With keys, guitar, bass, drums and percussion the total number of players is a whopping twenty and the sound is terrific as the band plays a range of soul, blues and Rn’B material associated with Otis Redding, Etta James, Solomon Burke, BB King, even Beyoncé. The whole album was recorded in Sweden and the musicians are the cream of the soul/blues scene over there. A number of vocalists are featured, including American Tad Robinson who delivers a solid version of an obscure 1967 tune by Jimmy Hanna, “Baby, Don’t You Lose Your Cool” which is driven along by the horns and lots of hand percussion. Knock-Out Greg may be a familiar name from his collaborations with British piano player Mike Sanchez and he gets two vocals: BB King’s “You Don’t Know” is superb with guitarist Magnus Josephson giving a passable impression of BB’s style and Jakob playing a great bari solo over a driving arrangement; “Working Man” is a Mike Bloomfield/Nick Gravenites tune written for Otis Rush who released it in 1969 on Mourning In The Morning and here features a barnstorming tenor solo by Christian Herluf Pedersen. Guitar Slim’s “Well, I Done Got Over It” has been frequently covered (Buddy Guy, Billy Boy Arnold amongst others) and is sung here in a swinging, latin-tinged arrangement by Sven Zetterberg who passed away last year. Marino Valle delivers two outstanding vocals on Solomon Burke’s “Down In The Valley” (great trombone solo by Mats Aleklint) and “That’s How Strong My Love Is”, written by Roosevelt Jamison and recorded by both OV Wright and Otis Redding – illustrious company to keep, but Marino acquits himself admirably. In a spirit of equality six of the vocal leads are shared between four female singers, three of whom also provide backing vocals on other tracks. The exception is Linn Segolson who sings the familiar “Baby, Please Don’t Go” (Big Joe Williams) in a very good version. Linn’s sophisticated vocal is supported by (yet another) magnificent horn arrangement with trumpet accents and baritone and trombone solos by Jakob Norgren and Magnus Wiklund respectively. EllyEve sounds great on the obscure 1962 Jesse Mae single “Don’t Freeze On Me” and bravely tackles “All I Could Do Was Cry”, a song from the Etta James songbook later reprised by Beyoncé. Beyoncé is also the source for “Suga Mama”, a funky latin piece sung by Graciela Chin A Loi whose other contribution is a song associated with a diva of a previous era in Peggy Lee – “Love, Your Magic Is Everywhere” – which is also latin-tinged with a featured trumpet solo by Jonne Bentlov. The final singer to mention is Kristina Talajic who sings the opening track “Love Addict” about which this reviewer could find no information! What is certain is that this rousing tune makes a formidable opener to a very entertaining album. 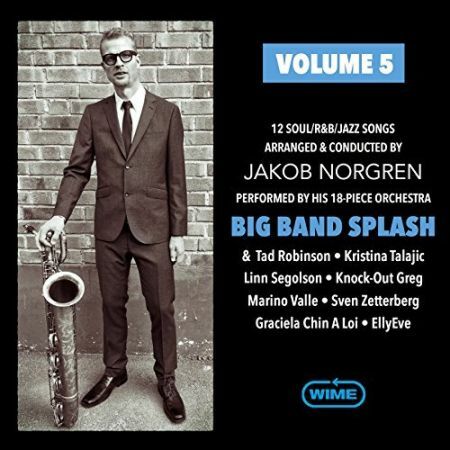 Kudos to Jakob Norgren for putting together a great album of big band soul and blues. This reviewer is now off to find the previous four volumes of this great material!